The GBF aims to inspire responsible leadership and global citizenship within the graduate business community in order to effect positive change. The leadership we want to inspire is not “just” leadership. It is the kind of leadership that is rare to encounter, but directly recognized when seen or heard of. It is the kind of exemplary leadership that sets a path where others want to follow. That understands and appreciates diversity. The kind of leadership that changes the world and those around us. Unfortunately, too many examples of true leadership go unnoticed; meaning opportunities are lost to learn, understand, be inspired and bring about real change. For graduate students, too many times, they enter their elected position as student leaders with the capacity to do great things, but without a proper transfer of knowledge and experience from the former leadership team spending precious time to reinvent the basics. The aim of the GBF is to lift truly innovative and sustainable leadership and examples from the unknown and share them as Leadership Best Practices throughout the GBF network of students, faculty, alumni and partners. To support graduate leaders to succeed making a reality of their visions. 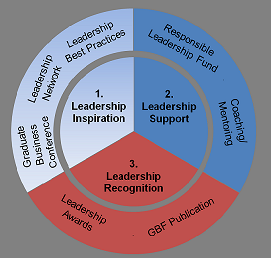 How does the GBF supports Inspiring Leadership? The GBF believes leadership can be developed and has therefore launched several specific initiatives since its foundation in 1983. All initiatives fall in one of three leadership development phases. Invitation to the annual global Graduate Business Conference; participation at Leadership Best Practice sessions. Access to experienced and influential leaders and thinkers in the world, to student leader peers and student leadership alumni networks. Invitation to the GBF Alumni Summits. Regular calls, seminars and regional Conferences discussing important leadership challenges in management education, business and society supporting continuing global and regional knowledge sharing, learning and leadership development. Access to leadership best practices and leadership lessons from student leaders at the top 50 Business Schools in the world. Access to financial and material support through the GBF “Responsible Leadership Fund”. Specific focus of the Fund is to provide financial or material support to leadership development in CSR, community projects and sustainable initiatives and research that improves the quality of business education to positively impact the world. Access to mentoring and coaching. The GBF provides support to student leaders to improve their success during student government leadership positions, to successfully deliver the projects and initiatives that have received funding through the “Responsible Leadership Fund” and to host the annual global Graduate Business Conference and/ or regional Conferences. Each year the GBF hands out its prestigious Leadership Awards. The most inspiring leadership achievements in the (graduate) business community are recognized during the annual Graduate Business Conference in front of the global graduate community and invited leaders by handout of the GBF Leadership Awards. We hope that the examples highlighted as Leadership Best Practice and the GBF network will inspire you to grow as a leader. In addition, that you will apply to our “Responsible Leadership Fund” or be nominated for our Leadership Awards to increase the impact of your Leadership Best Practice and turn your work into a legacy others can learn from.